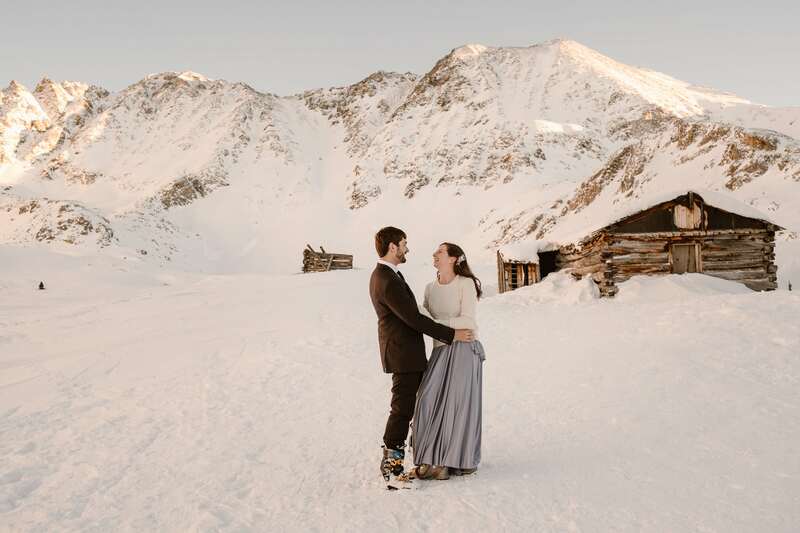 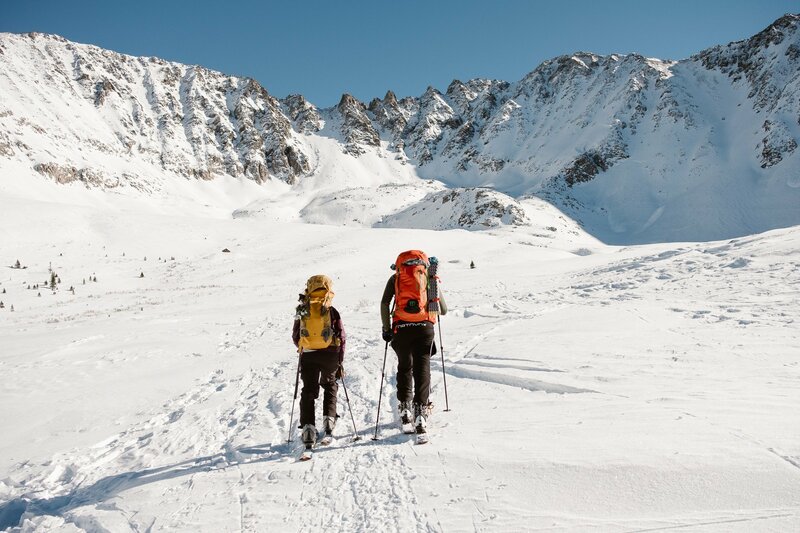 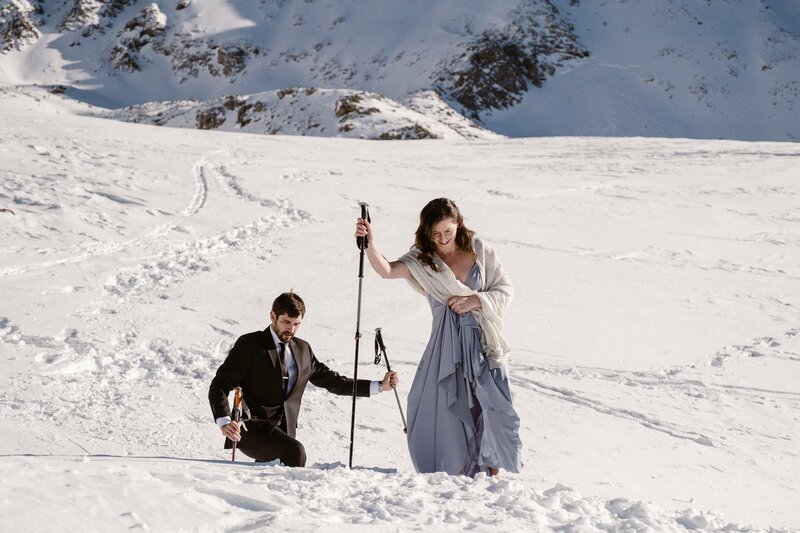 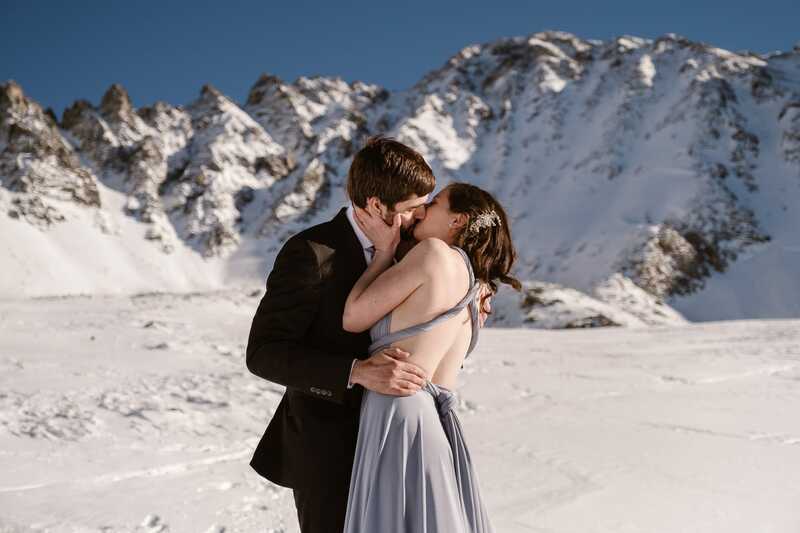 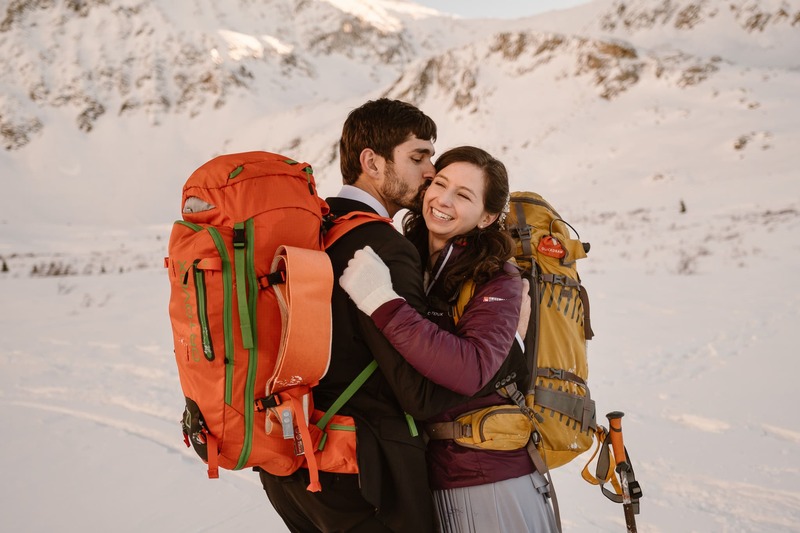 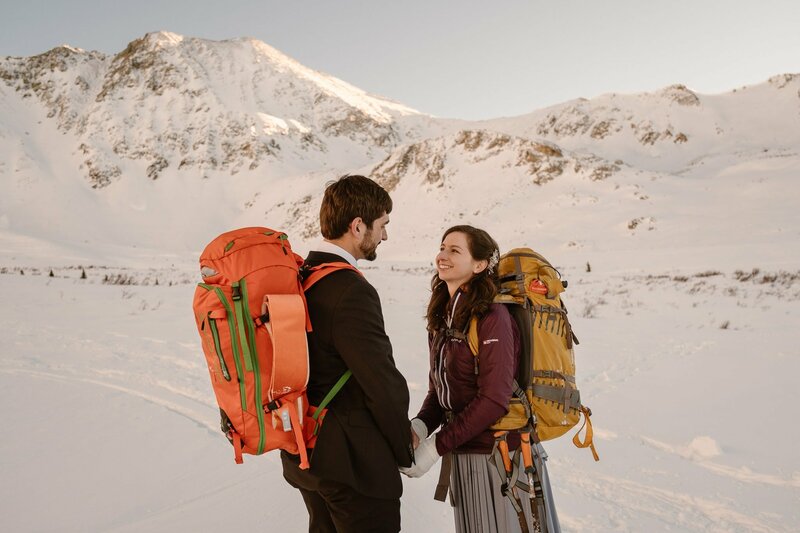 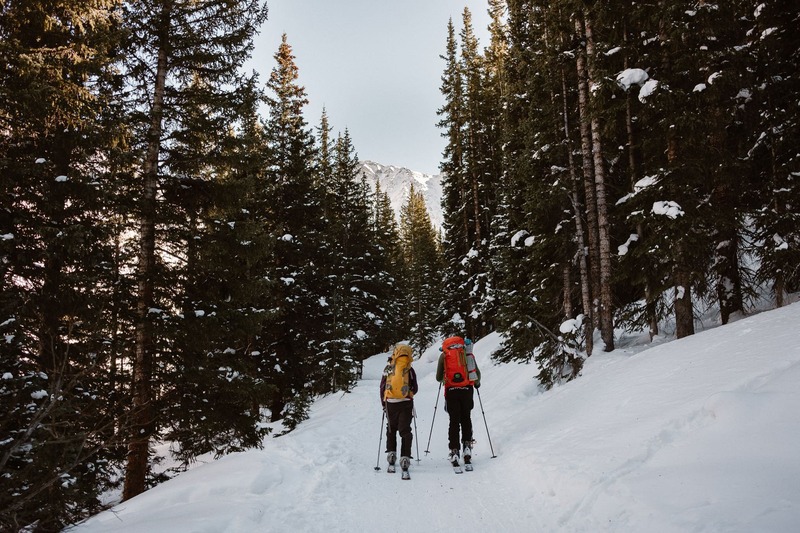 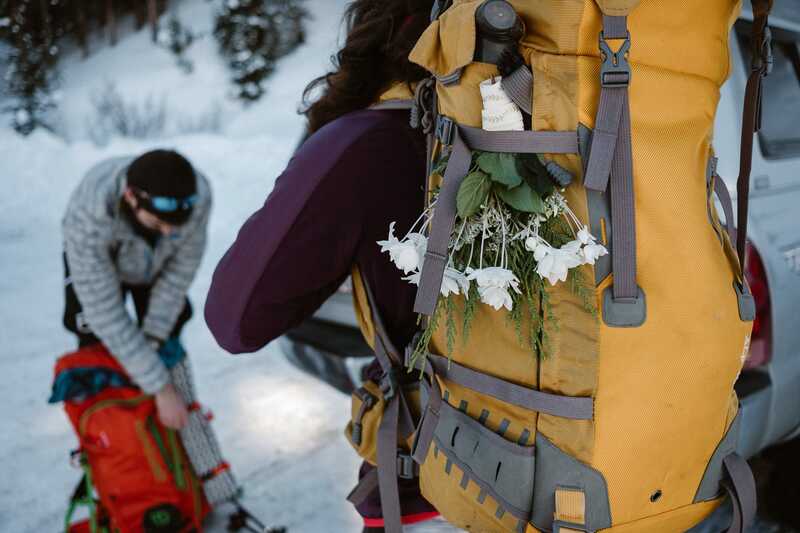 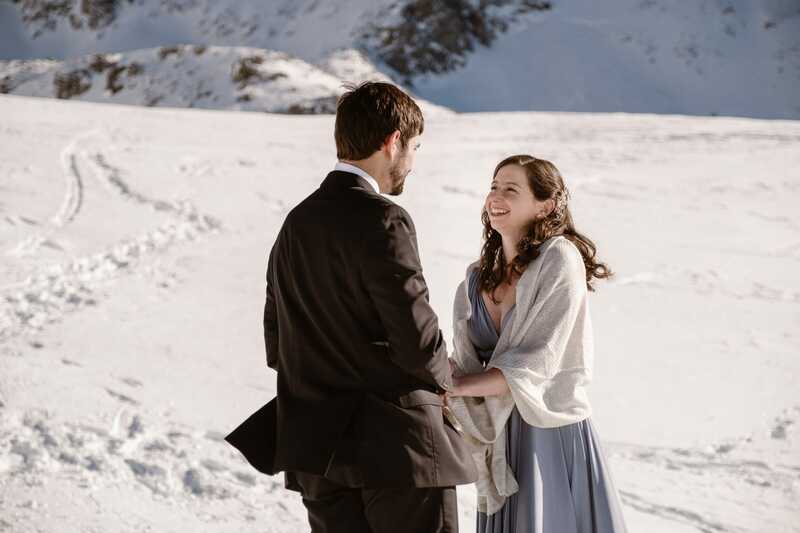 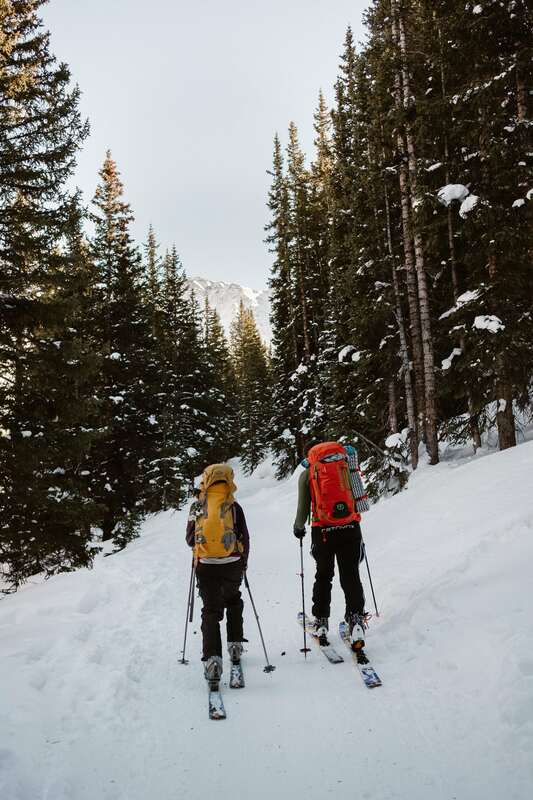 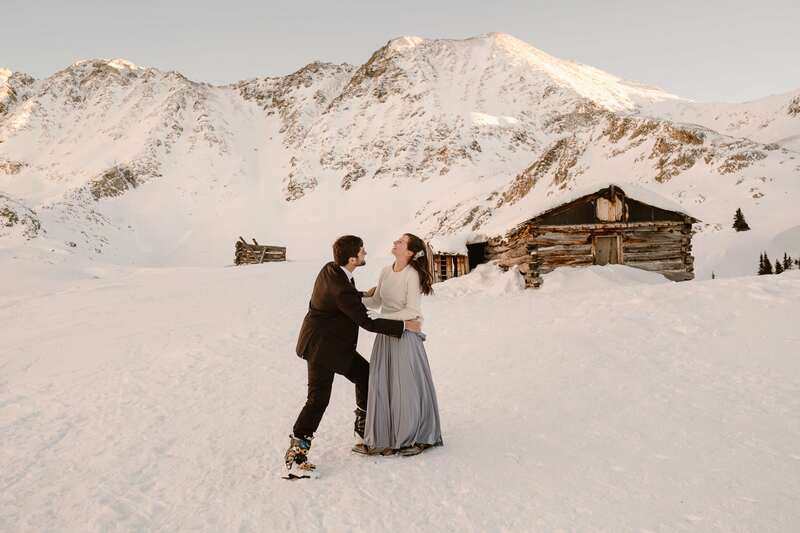 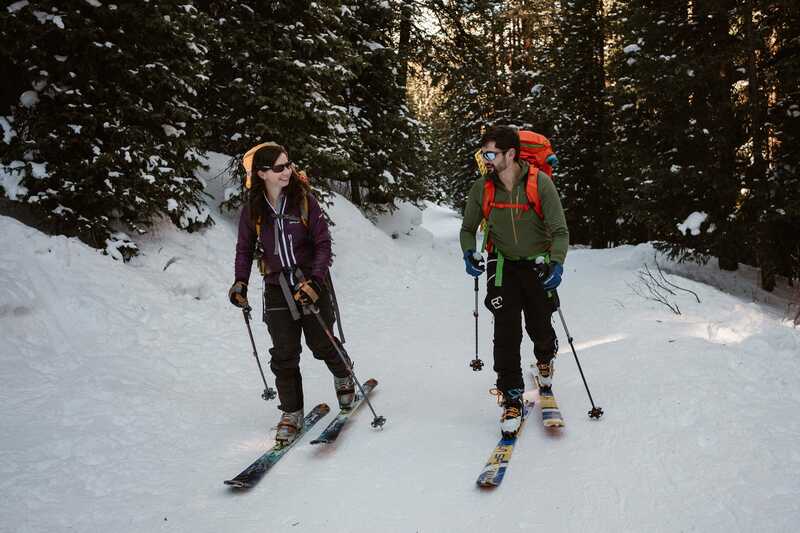 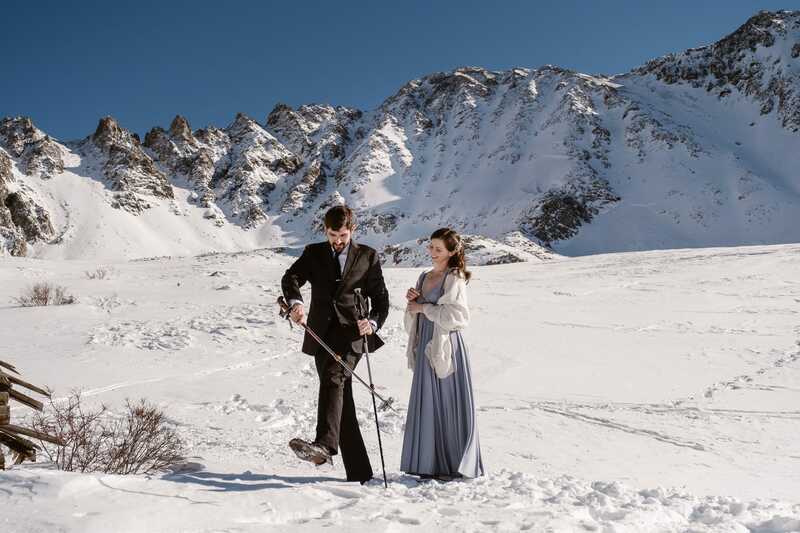 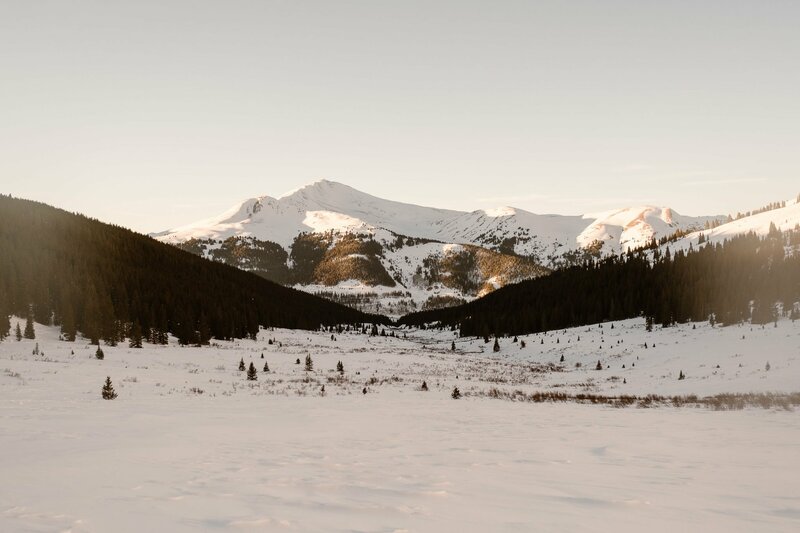 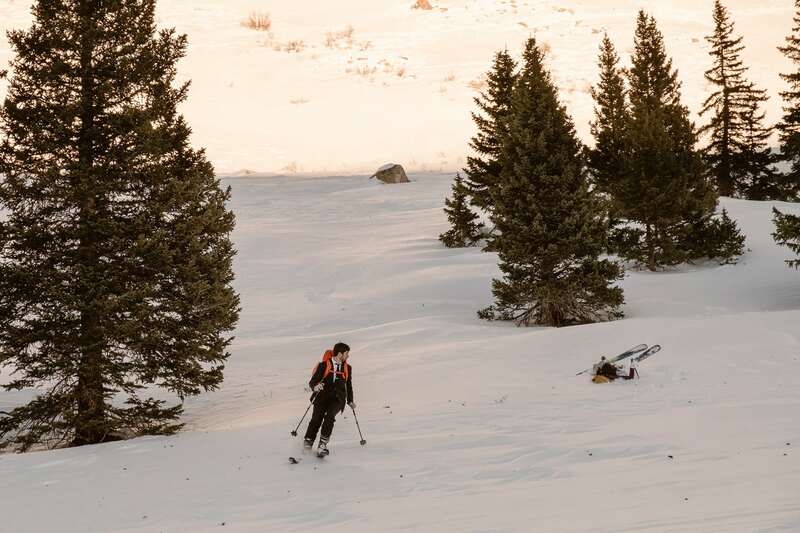 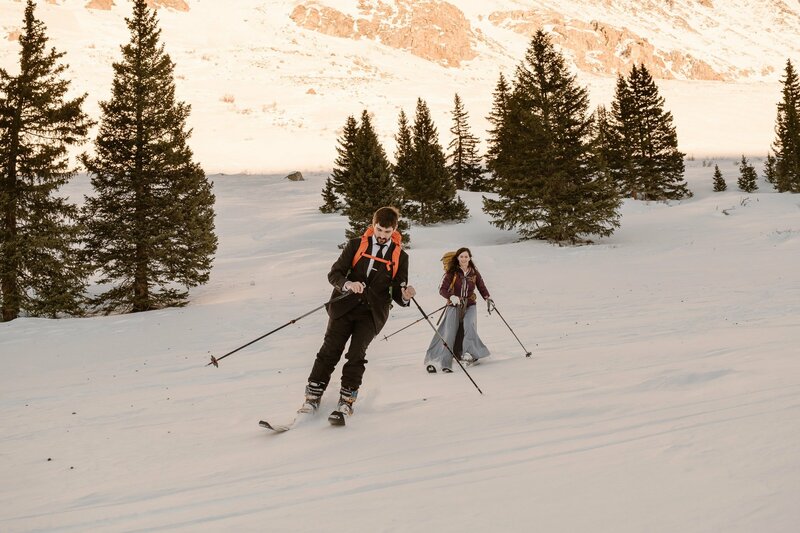 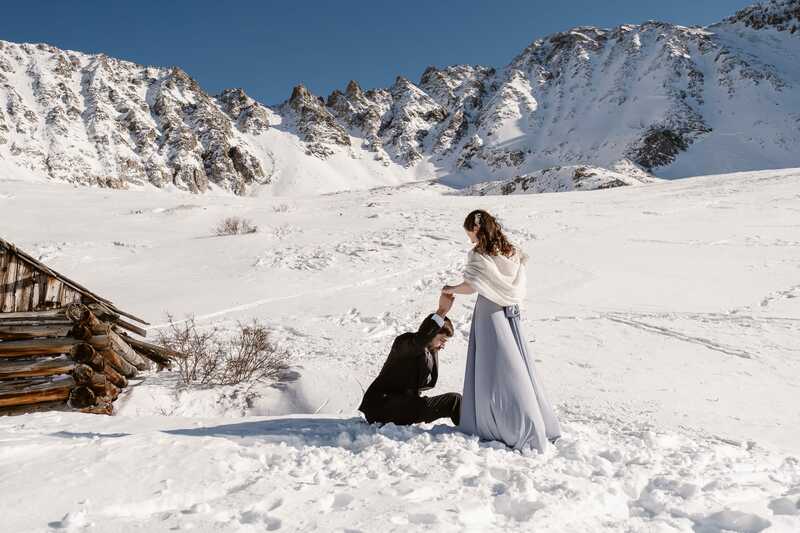 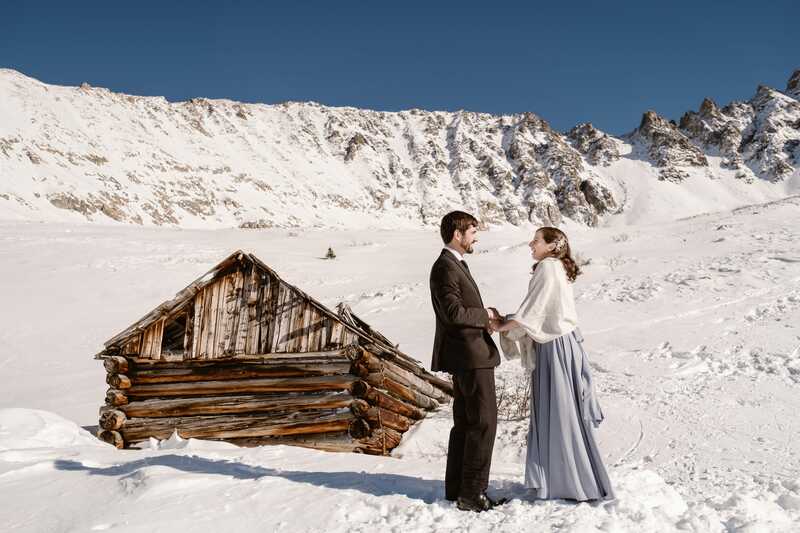 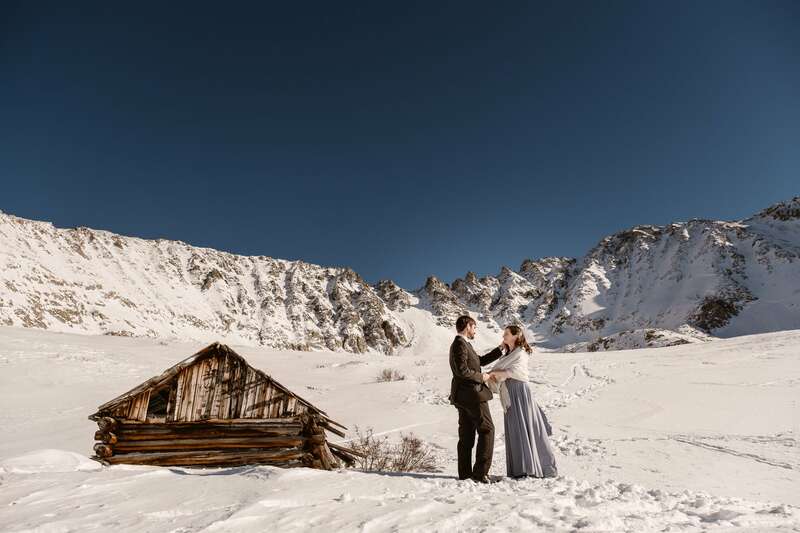 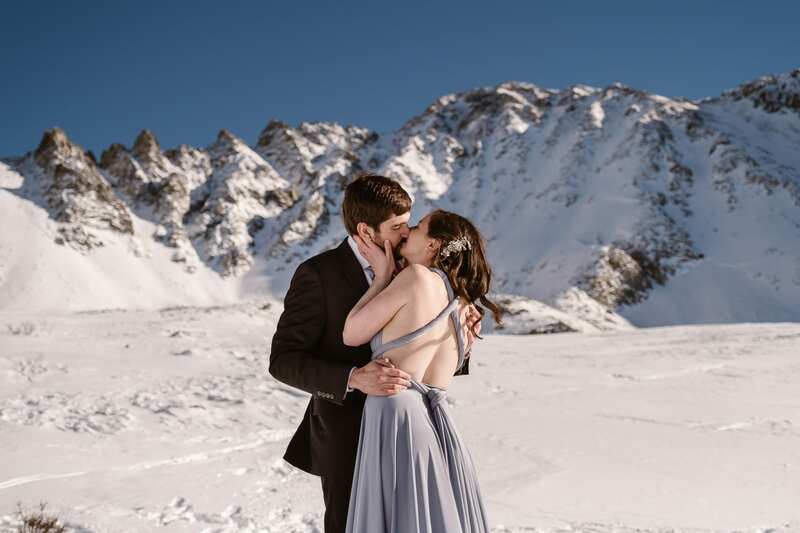 When the Boulder-based couple first reached out to me, their plan was to have their backcountry skiing elopement ceremony at Bear Lake in Rocky Mountain National Park, then skin up to Lake Helene for more photos and some turns. 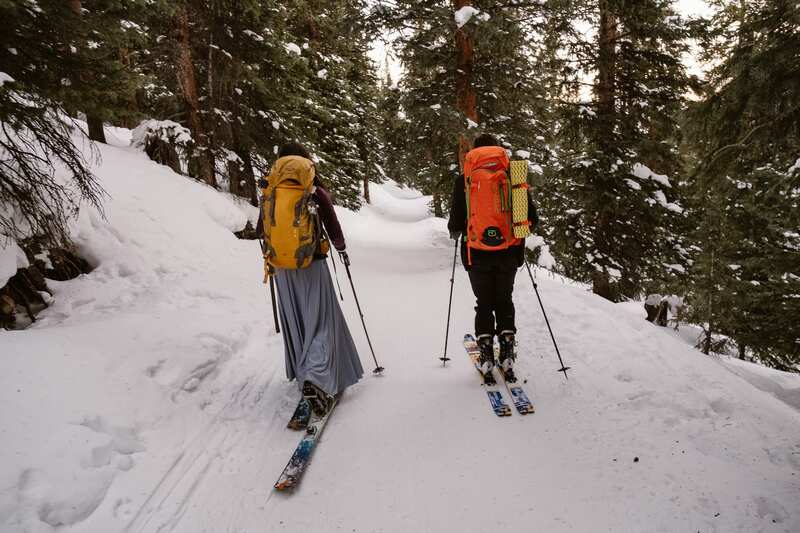 Then the government shutdown happened, and we had to come up with new location ideas since RMNP was closed. 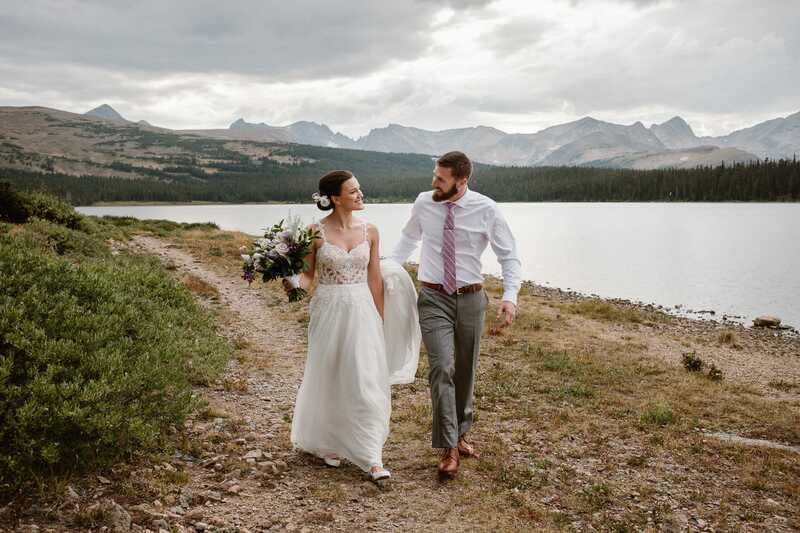 We were throwing around different options in Indian Peaks Wilderness, before finally settling on this area in White River National Forest, between Leadville and Copper Mountain. 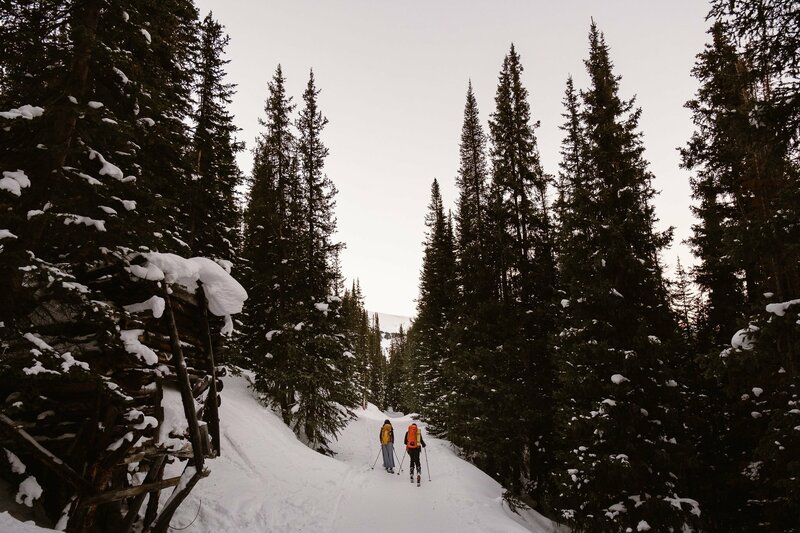 It was important for all of us to have a private location rather than going in a busy area where there would be lots of people around. 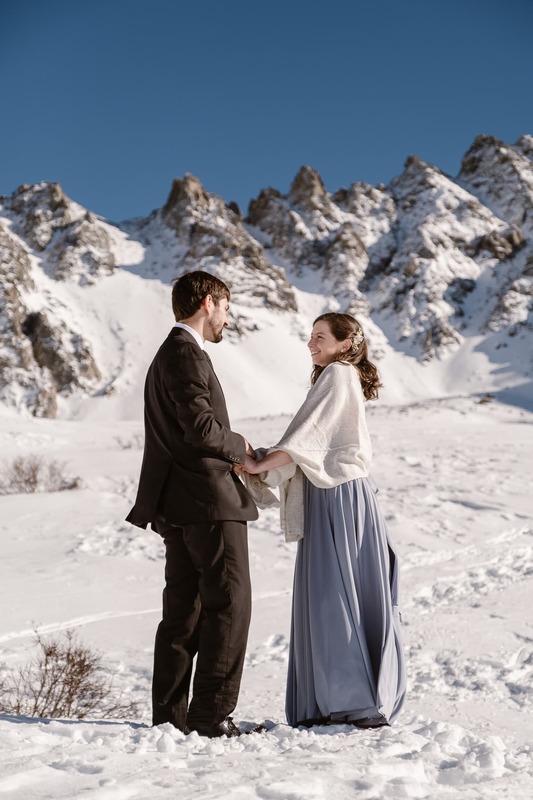 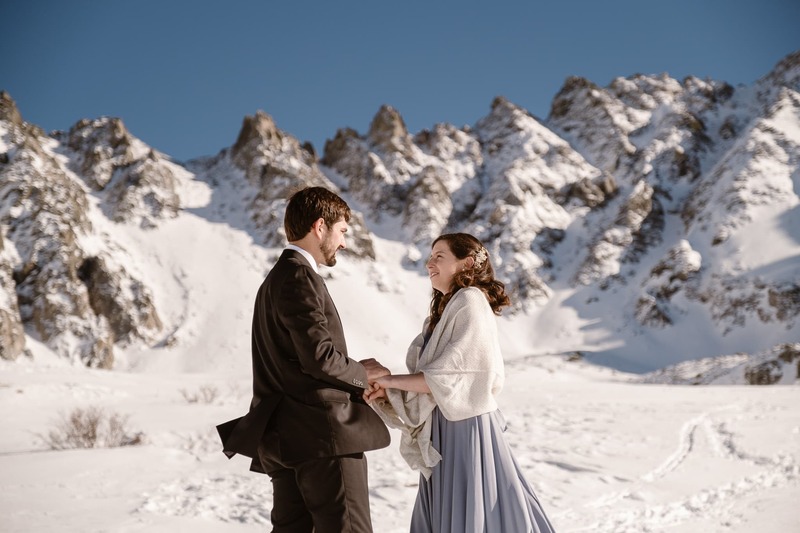 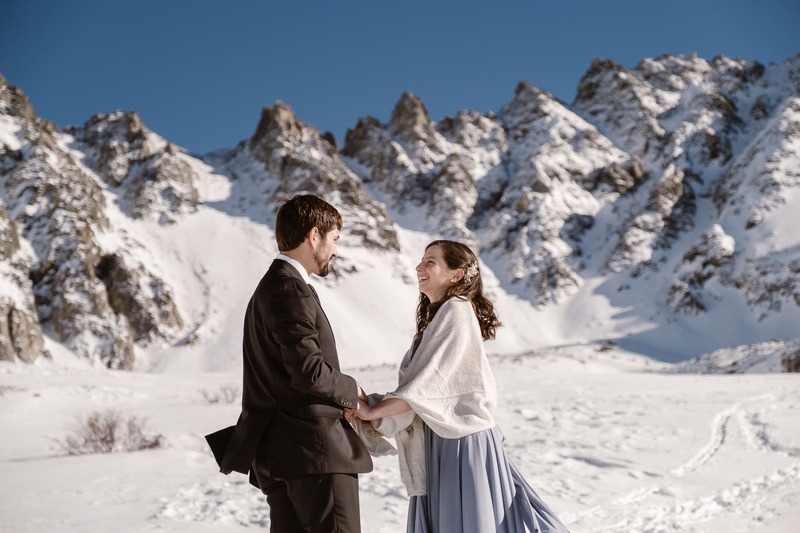 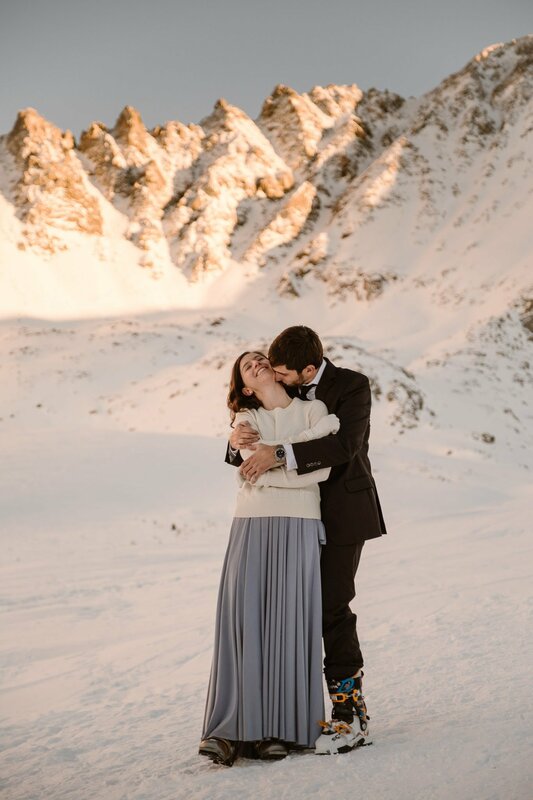 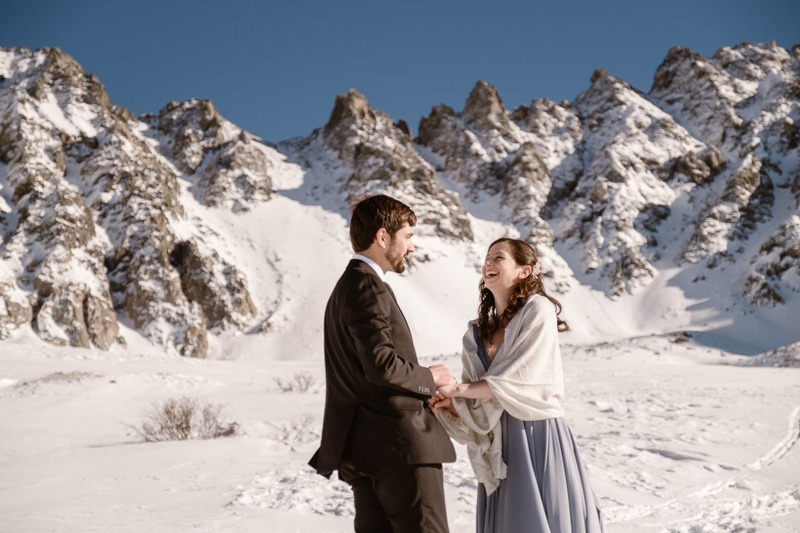 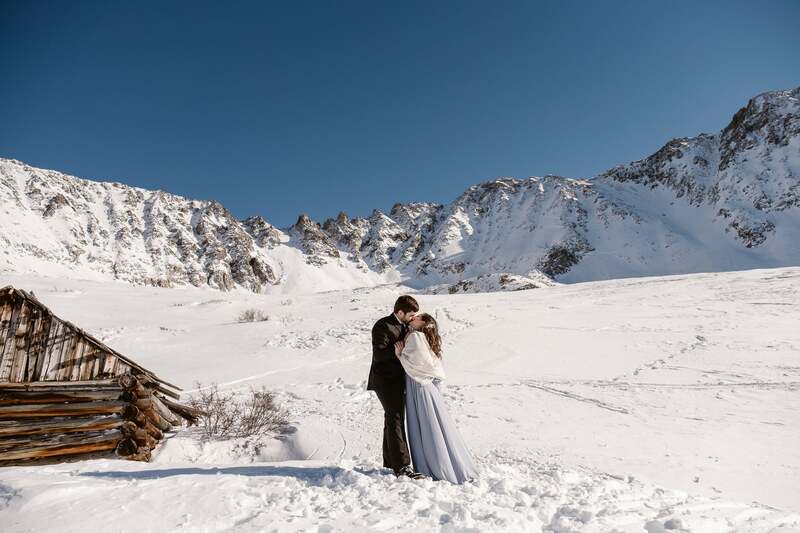 Luckily with eloping on a Friday in January, we only ran into a few people on the first part of the hike/skin up, then had the cirque completely to ourselves for the elopement ceremony! 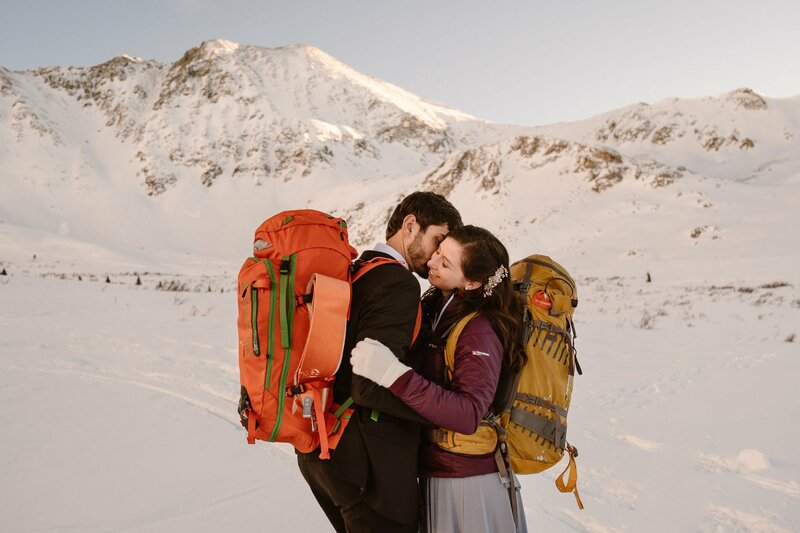 As we were heading up the mountain, Christine and Jordan were telling me how they’d told one of their friends that they were doing a backcountry skiing elopement, and that her reaction had been “OF COURSE you are!” And I really think those are the absolute best kinds of weddings – where you create a day that truly speaks to your relationship and what you love doing! 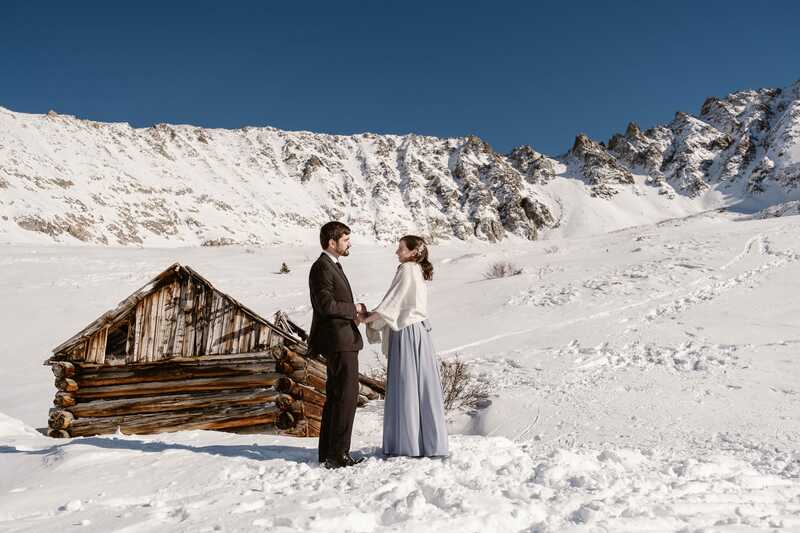 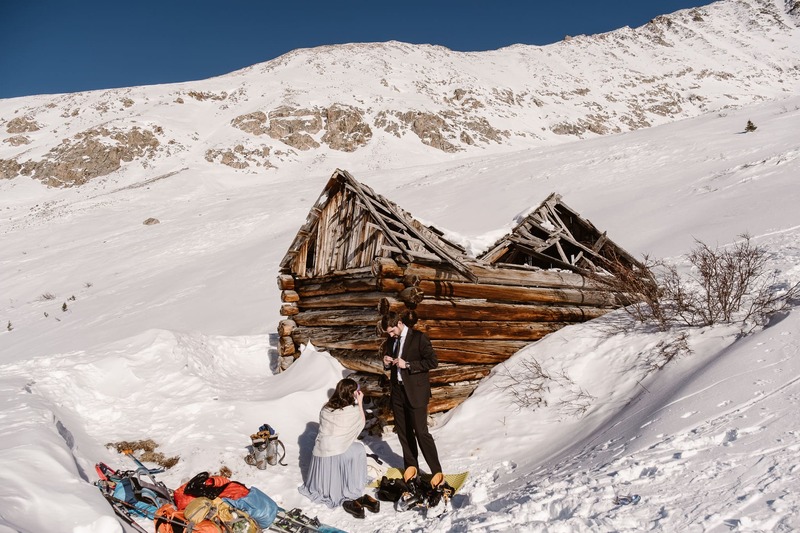 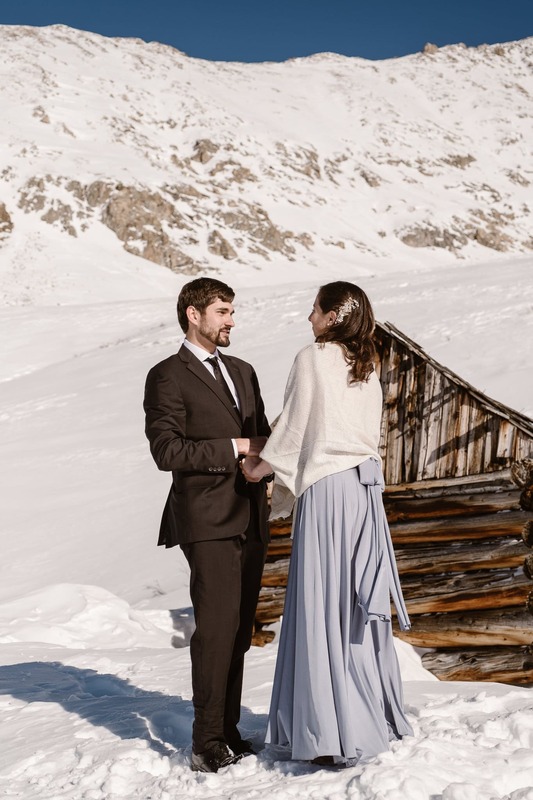 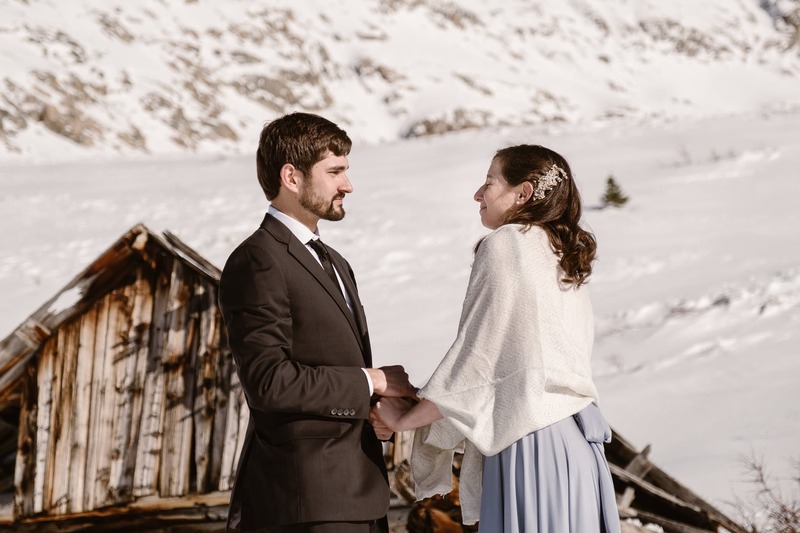 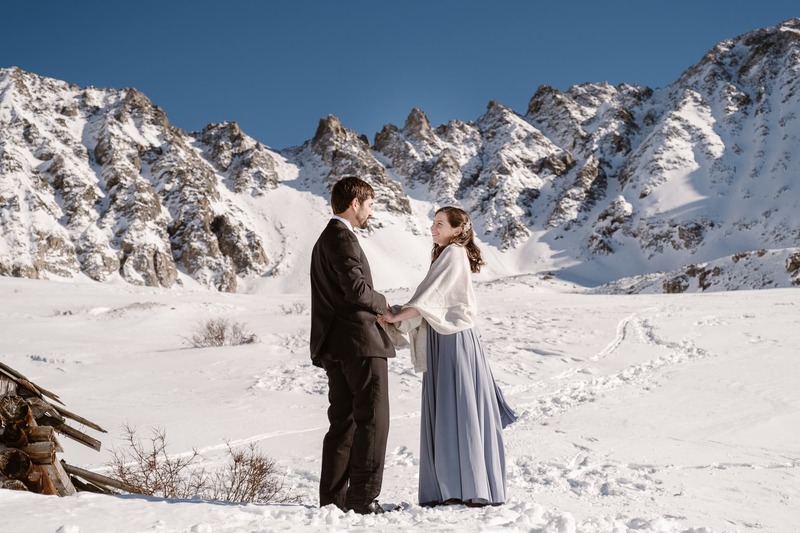 I’ve been more and more drawn to capturing real moments instead of staging things for the “perfect” photo lately, and I love how that’s exactly what happened when Christine and Jordan got dressed next to an old mining cabin. 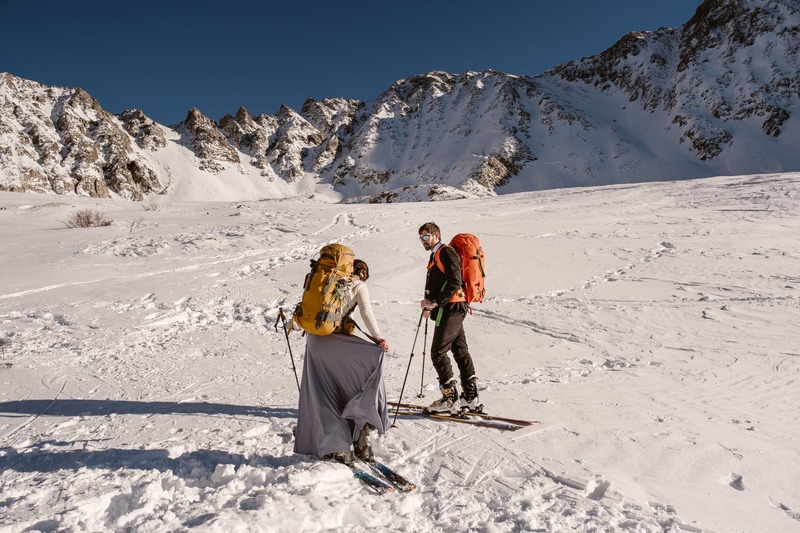 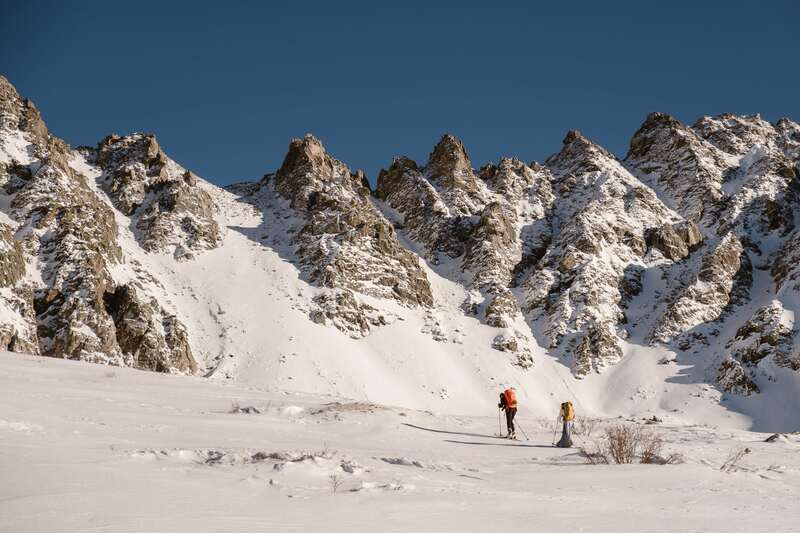 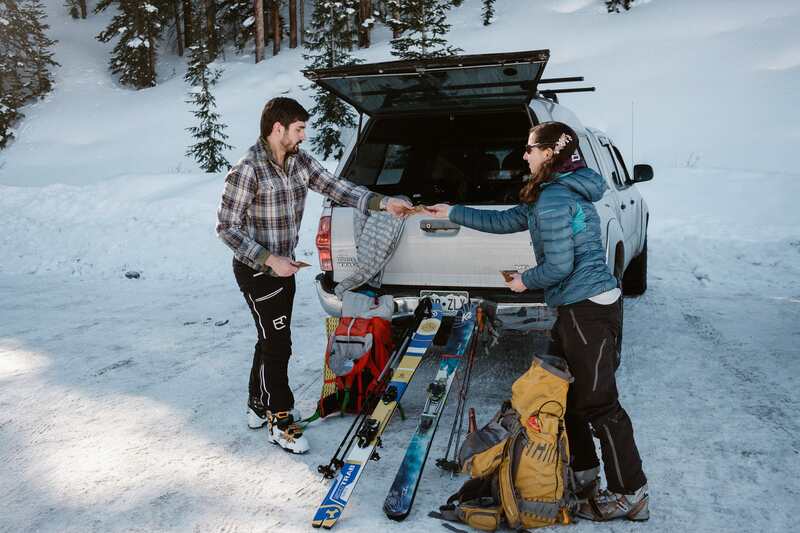 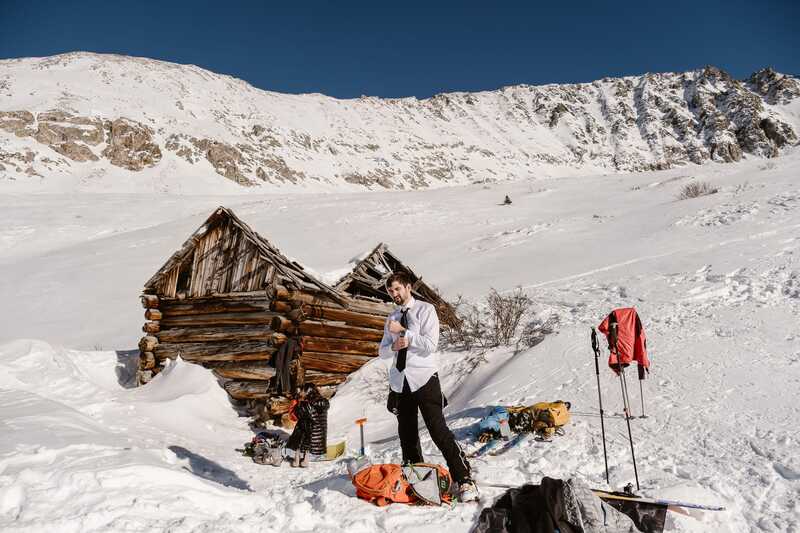 With our gear spread out all over the place, Jordan packing down the “ceremony site” with his backcountry shovel, and Christine getting dressed standing on a sleeping pad, it was real life and so much better than any staged shots. 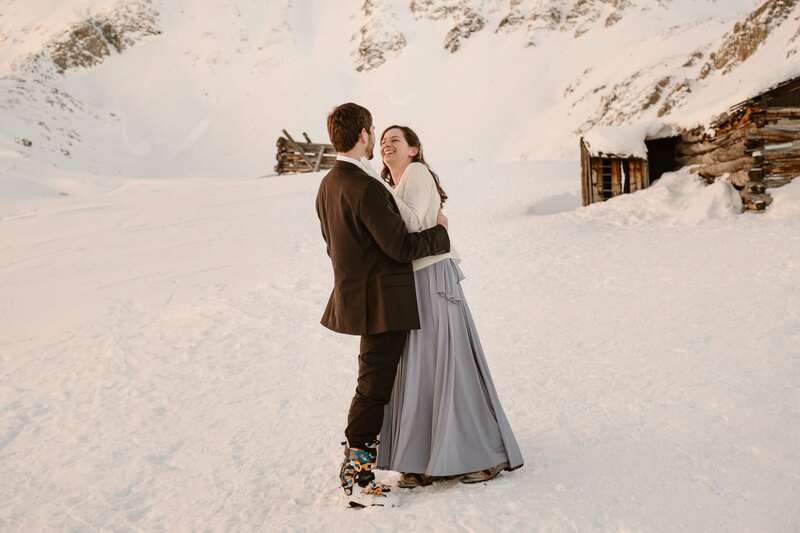 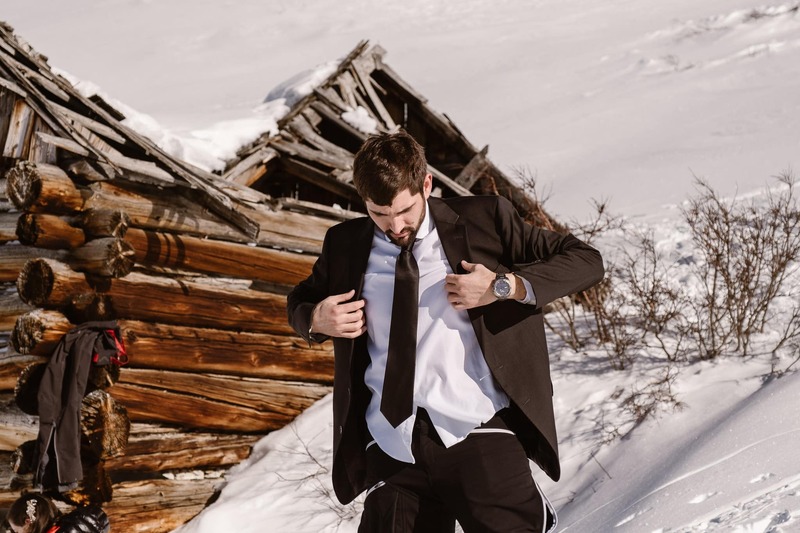 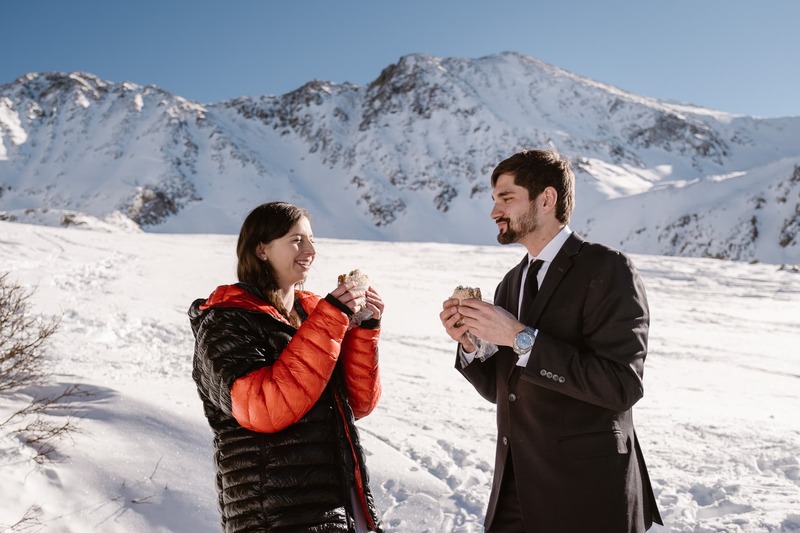 I was super impressed when they pulled dress shoes and ankle boots out of their bags, but the nice shoes created some fun situations as they tried walking through the knee-deep snow without falling. 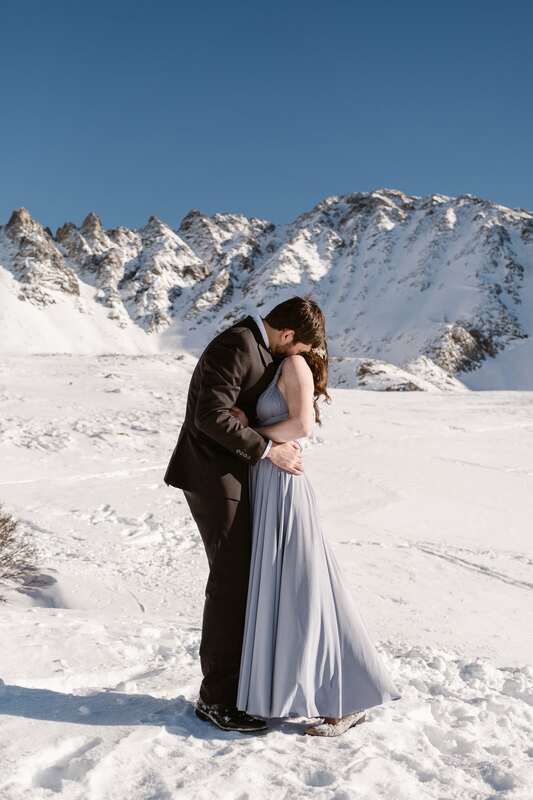 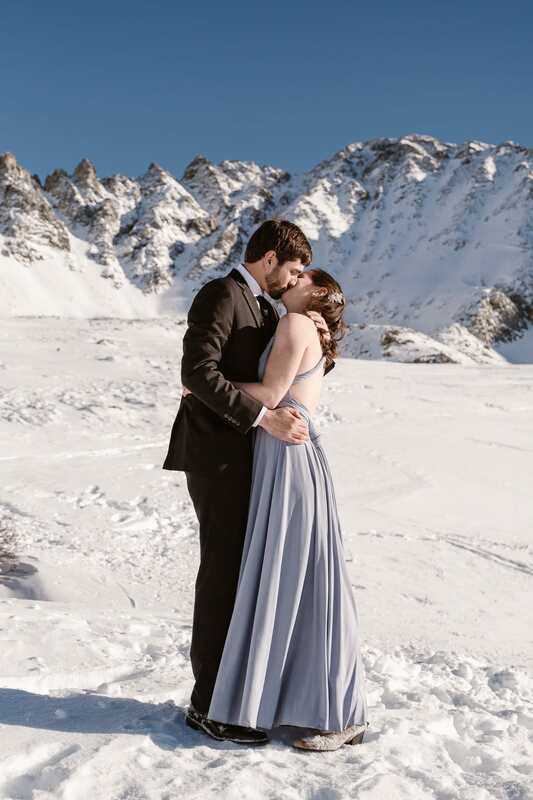 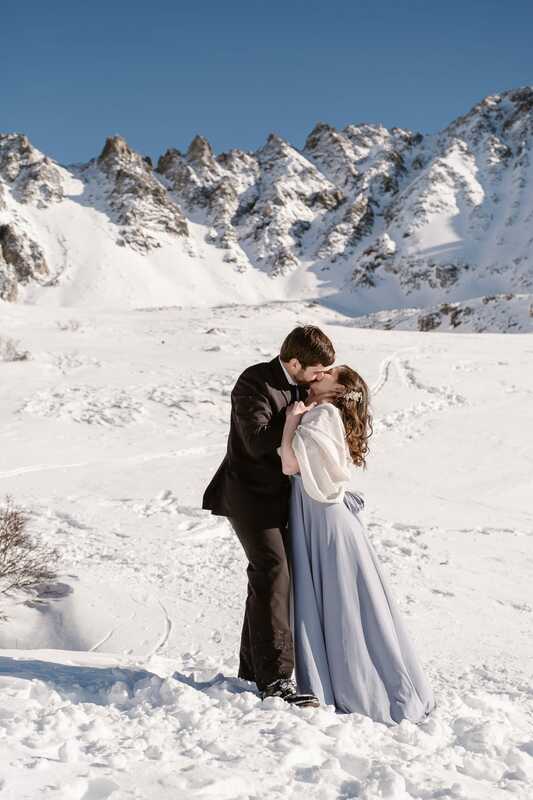 Then at the end of their ceremony, as they went in for their first kiss as husband and wife, they both slipped and fell into the snow! 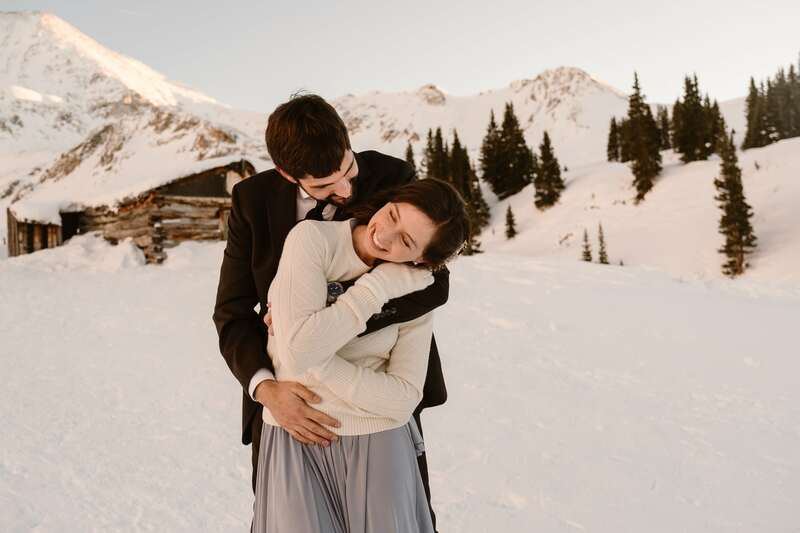 We were all laughing so hard, but it really was the perfect moment. 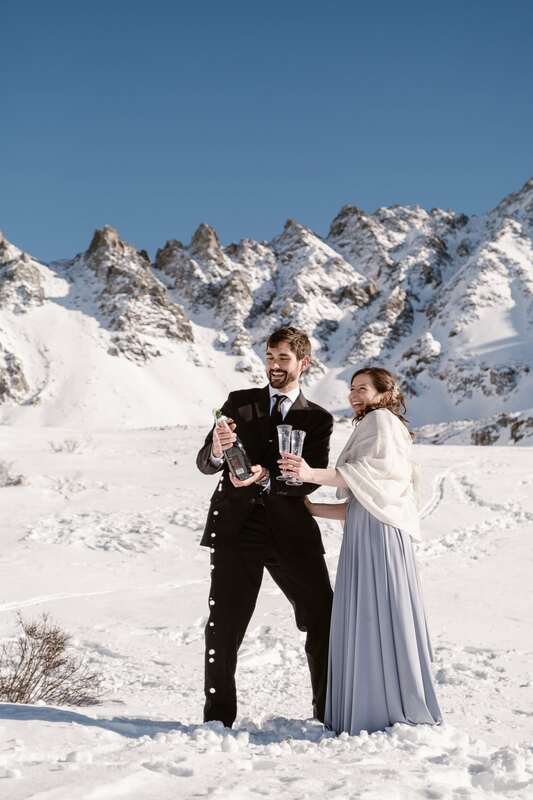 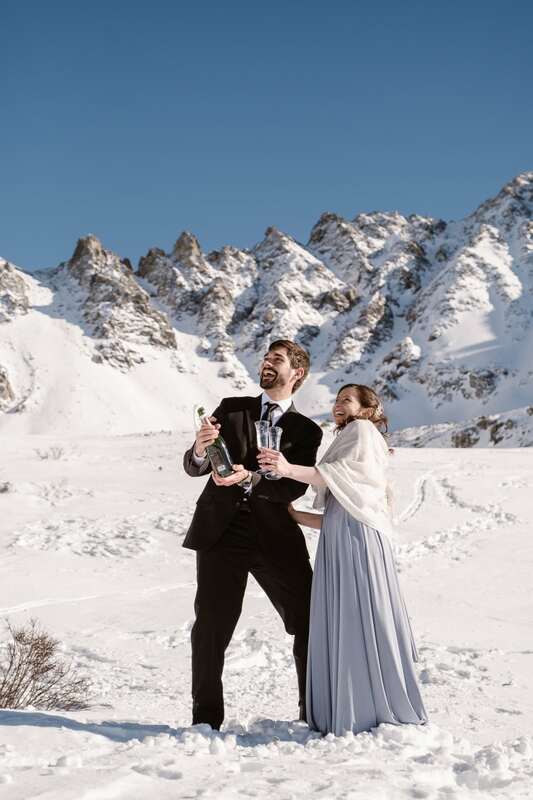 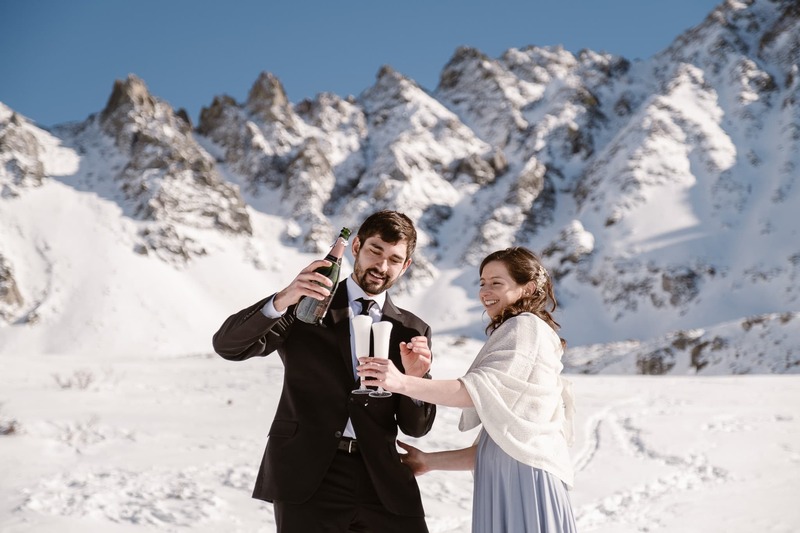 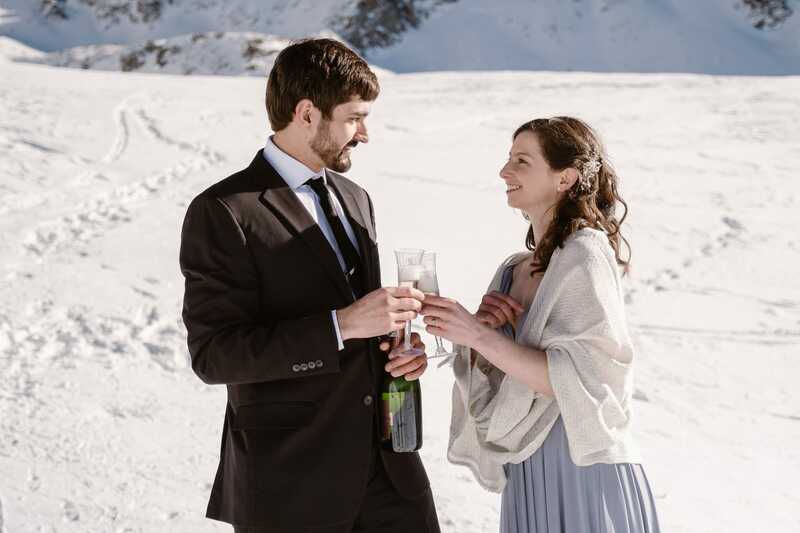 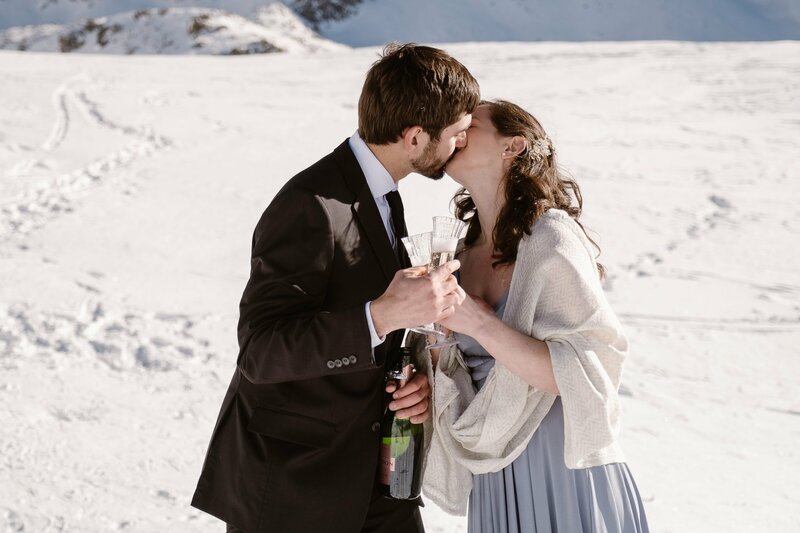 After the ceremony, we munched on homemade cookies and PB&J sandwiches while sipping champagne, then packed up and headed out to earn some turns. 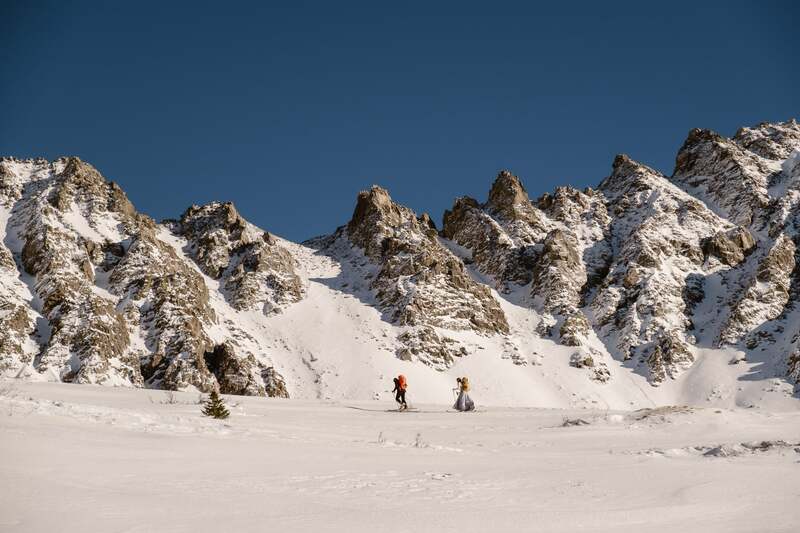 The snow was about as crappy as you’d expect from a sunny day in early January – knee deep with a thick crusty layer on top – but we still had so much fun! 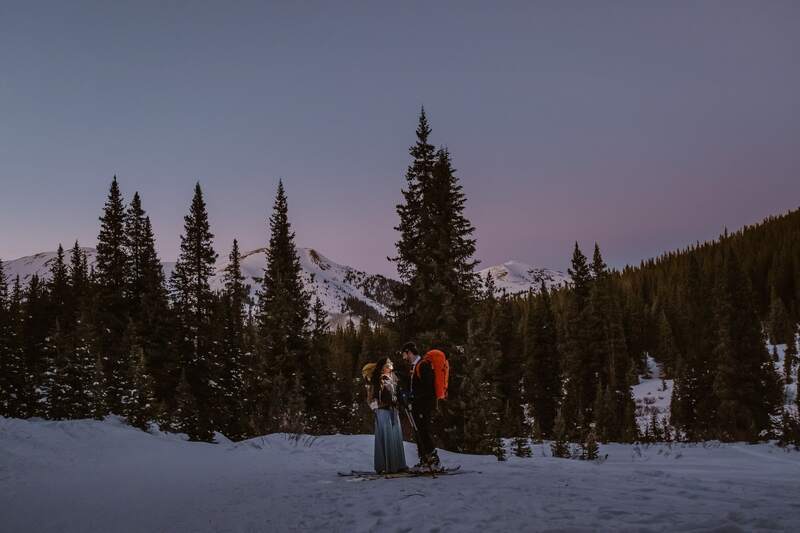 By the time we got back down to our cars, we had been out for their backcountry skiing elopement for seven hours, and if not for sunset I easily could have hung out with Christine and Jordan for another seven! 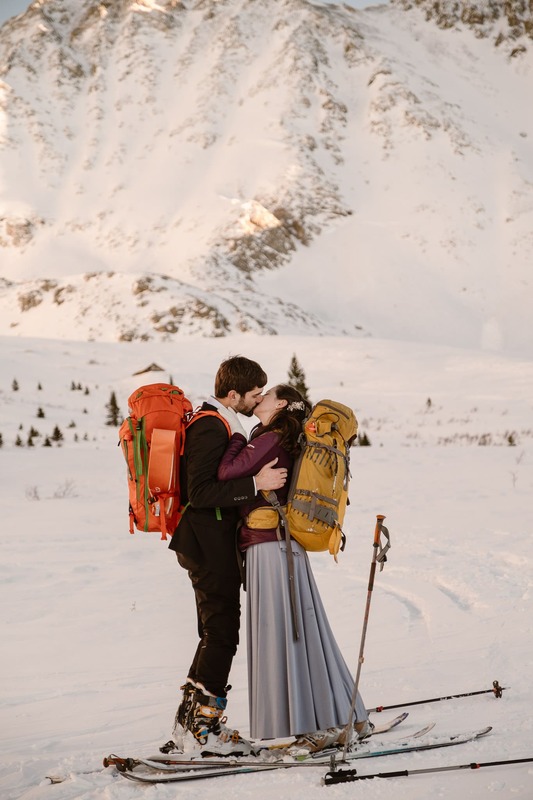 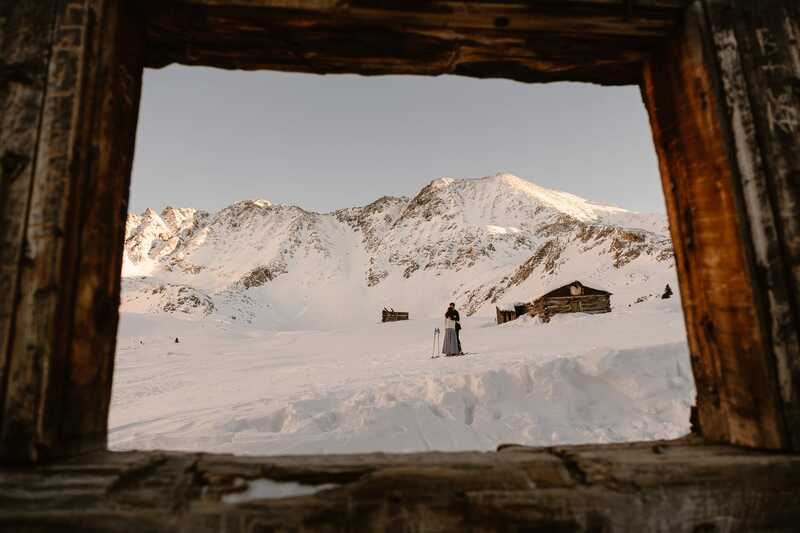 I’ve already written way too much about this backcountry skiing elopement, so I’ll let the photos do the talking now! 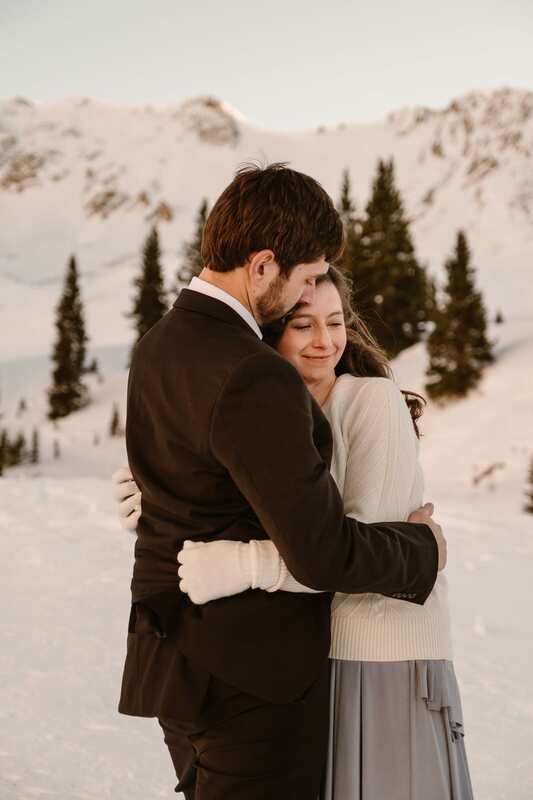 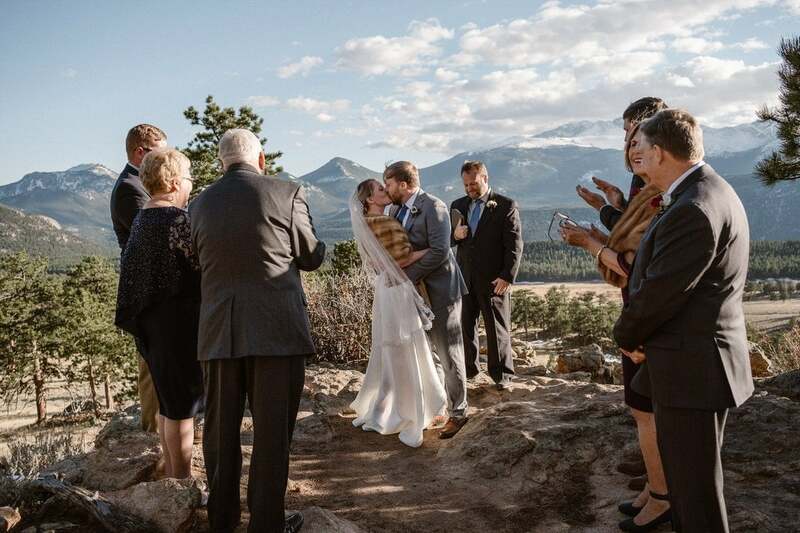 And if you’re looking for a Colorado wedding photographer who can keep up with you in the snow, get in touch – I’d love to work with you!